We’re excited to announce the appointment of Cameron Stanley to our Senior Coaching Team. Cameron is a strong believer in dry-land training and mindfulness, has a silver coaching qualification and is truly an inspirational leader, motivational speaker and an awe-inspiring addition to our coaching line-up. The Christmas School holidays were not just about relaxing for PSC's Robson Wallace. He headed to Taupo to compete in the Open Water Championship in January in both the 5km and 10km Open Water Swim events. The 5km Open Water Swim was also the New Zealand Secondary Schools Championship event. Unfortunately the 10km event did not go as Robson had planned and he was DQ'd. We all know how that feels after completing an event that we felt went well! Utterly destroying. And 10km's is no walk in the park or in the water as the case may be. So that's why it is so fantastic that Robson picked himself up from that disappointment to focus on his other event, the 5km swim the following day. Robson finished 1st in the Open Water Championships Male 13-15 with a time of 1:03:28. He was 8th overall. This also led to Robson winning the New Zealand Secondary Schools Championship in the Male 14-15 category. Well done Robson. The entire team at Parnell Swim Club are incredibly proud of you. There is so much to be excited about following the NZ Short Course Champs recently held in Auckland. 10 PSC swimmers represented the club extremely well and raced with 100% effort and wolfpack grit. The team did an amazing job at managing school and other sporting commitments leading into the meet and the high attendance at training most certainly paid off. Huge congratulations to Imogen and Olivia for making their respective NZ development teams and attending the camp held after nationals. And finally, a Wolfpack howl out to our medallists. Apologies, now all of our awesome team were around when this pic was taken. Term 4 and not the week before is the time to start to take your swimming seriously if you want to clean up at the next school swimming sports competition. 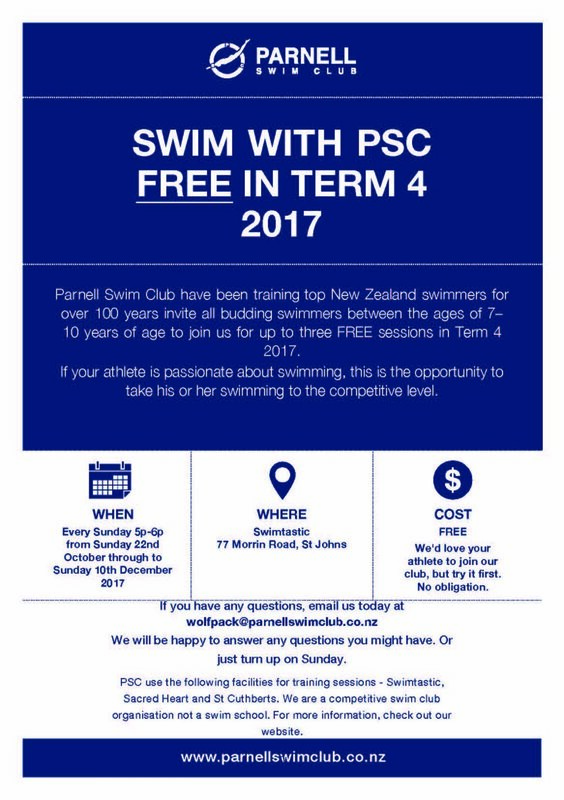 Parnell Swim Club is not a swim school. We're a competitive swimming club that work with young athletes between the ages of 7-18 to take their swimming to the next level. We know how to have fun too. We affectionately call our young athletes the Wolf Pack and with the best coaches who have enjoyed international success themselves in the competitive swimming arena, if your swimmer wants to get seriously fast in the pool - then you need to contact us today. Try us for free with our Term 4 promotion or if you can't wait until then, contact us today as we're still training through these school holidays. Over 65ks swum last night in our first ever Swim-athon and what a roaring success it was. Amazing team of athletes with huge smiles on their dials from the 7p start right through to the midnight end. There was fierce competition in the final 30 minutes by our teams to clock up the greatest distance for the night and a whole heap of fun was had. Incredible parents supporting and helping ensure the event was everything we hoped it would be. Huge thanks to Mark Bone and Swimtastic for letting us use the facility and to everyone who got involved. We'll post more action shots throughout the week as they come to hand and will let you know our grand fundraising total once it's tallied. Thanks to our awesome prize sponsors too - DQ'd, Jolyn Swimwear and Fit for Purpose Sports Massage. Introducing the first ever PSC Swim-athon. It’s the ultimate challenge for All PSC Athletes. Click on the attached pdf for all the details and register by FRIDAY 7TH JULY 2017 to take part. It's going to be EPIC!!!! We caught up with Imi last month and thought we would take the time to share a bit about her given her incredible success in swimming to date. Imogen is one of the long standing PSC team members having joined the club at 9 years of age. Since then, the success she has achieved in the pool is huge. She qualified for the Victoria State Age Group Championships where she competed last December and won gold medals in the 100 & 200 15 year backstroke. In doing so Imi scored sufficient FINA points from her times to be selected for the Youth Commonwealth Games nomination list and be selected in the Swimming NZ team to compete in Australia at the State Teams Age Short Course Championships in September this year. Over her three years of competing at NAG's and NZ Short Course champs she has won a number of medals helping PSC to some good overall team results at these meets. She is a fine example of what hard work and commitment can achieve and on top of that, she's not doing too badly at school either having been awarded the Scholars Award for a 90+ GPA, Year 11 endorsed with Excellence and is a Tutor Group leader. How do you prepare for a big swim meet? Imi: I don't really ... I try to keep casual and relaxed and not think about it too much. I normally only think about the race 5 minutes before I am about to start. What are you thinking when you are standing on the blocks? Imi: All I think about is the first lap and smashing it. Why do you continue with the early morning starts ... 4:30am is very early. What makes you get out of bed? Imi: It's easy to get up when I am going to the pool to see a bunch of friends. On top of that I like to achieve my goals and make NZ swim teams. I have learnt that hard work pays off. What is one thing swimming has taught you? 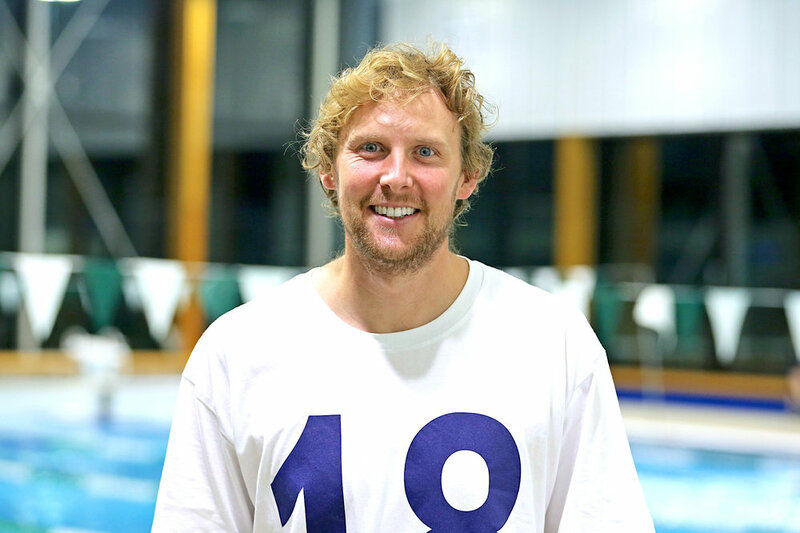 Imi: I have been swimming competitively since I was 9, so I have learnt discipline and motivation to win. ... that's two! I am also more independent and organised as a result of swimming and I like all of the little kids on camp and enjoy the chance to lead on camp as well. Imi: Katie Ledecky because she had such big success at a young age and proved that age doesn't matter in sports. What would your message be for a 10 year old who has joined our swim club? Imi: To have fun in the pool and not to take yourself too seriously. What are the challenges you face on a day to day basis? Imi: Sometimes trying to stay awake in class after the early morning starts and generally just juggling training and school work. Anyone you would like to give thanks to? Imi: Mum and Dad for being the taxi. My friends for having a positive influence and making me happy and my coaches for persevering. Imi: At an American University but no idea what I will be studying. And Imi, we have no doubt at all that you will achieve your goals. Keep going for GOLD! The Harlequins made it a clean sweep to retain honours at the New Zealand Zonal Championships at the Sir Owen G Glenn Aquatic Centre in Auckland and our very own Annabelle McLaren and Sean Gibbs helped make the magic happen. A whopping 160 of New Zealand’s leading and up and coming swimmers were pitted against each other in the competition. Swimmers from all regions in the country are divided into four zones which compete in replay and team formats over two non-stop two hour sessions. Each team is made up of 10 male and 10 female swimmers in the under 16 competition and the same sized teams in the 16 and over competition. Both Annabel and Sean competed in the under 16 competition. The Zonal Championship honours went to the the Harlequins in both competitions. Well done Annabelle and Sean. We have no doubt that they could not have done it without you. Four of our PSC team made the podium at NAGS this week and on top of that, on the last day, our relay team came 2nd and we could not be prouder. Under the masterful coaching professionalism of both Sam and Kurt, our athletes all swam incredibly well. This is the pinnacle swimming event for the year for our athletes and with three of them striking metal we could not be prouder. Huge congratulations to our podium winners - Sean (100m Free), Imogen (100m Backstroke), Annabelle (200m Fly) and Isobel (200m Fly 16 yrs). What an awesome result. The training the entire team put in to simply quality for this event let alone be on the podium is monumental and we are truly thrilled with the teams success. Parnell Swim Club had a huge contingent of athletes at the recent three day NZ Juniors Harlequin event held at Westwave. With 24 of our junior swimmers 12 years and under competing over the three day event, having qualified through out the season for the 2017 Junior Zonal Festival, it was a team to be reckoned with. It truly was amazing to see all our swimmers smash their personal best times. Not only that, a whopping six of our PSC athletes achieved podium finishes resulting in medals. Parnell Swim Club finished 5th overall in the Harlequins Zone. Well done to all our Junior Athletes. You should be suitably proud of your achievements and thanks to all PSC Parents who competed duties through out the weekend. The hard training sessions, summer camp and the commitment that all put into this pinnacle event clearly paid off.